Beat This Caption Contest 16 Winner – Caption Contest Funny Clever Witty Enter Today! Mom, what’s the difference between #1 and #2 ? 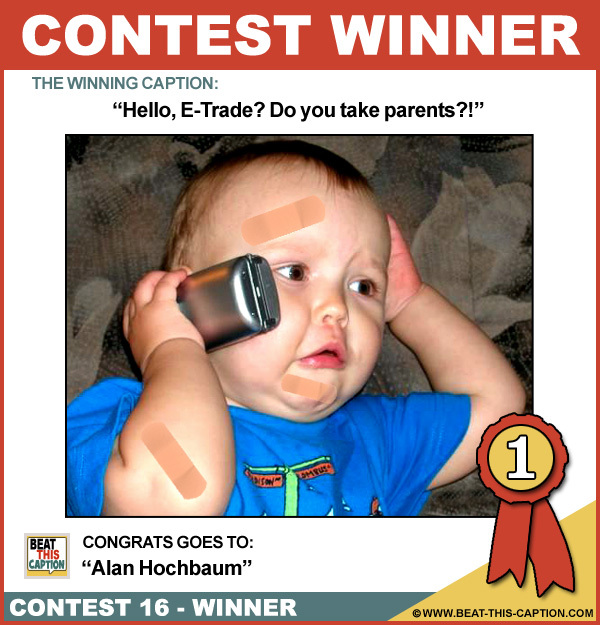 Hello, E-Trade? Do you take parents?! Oh no – now I’ve gone and stapled my ear! Hello? Dr. Kevorkian? yes, what time was my appointment again? I’m afraid the baby-sitter’s dead! Hi Grandma, why didn’t you tell me that learning to eat with a fork can be dangerous! Stormin’ Norman….. The early years! Hello, “Jackass”? You were right, DON’T try these stunts at home! Quick! Quick! What’s the number to 911? !